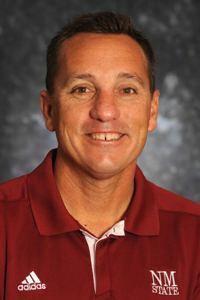 Brian Green was named the head coach at alma mater New Mexico State this past summer. Serving six years as offensive coordinator and infield defensive coach at Kentucky, Green helped develop the Wildcats into one of the top offenses in the country, leading the SEC in eight offensive categories in 2014. He has developed the reputation as a top recruiter and elite hitting instructor. Inside Pitch: First things first- what do you look for when recruiting? BG: We look for hitters to have rhythm, we look for them to have the ability to recognize pitches, we look for balance, and we look for bat speed. Those are the big ones; how does a guy commit out of the pitcher’s hand? Does he appear to have the ability to recognize a pitch? How much does he swing and miss in recruiting, or does he swing and miss at all? Those are things we can take and project for the next level. Another thing is just like you try to stay away from arm issues when you’re recruiting a pitcher, it’s the same recruiting hitters, you want to make sure they have a clean hand path. I think you can always assist a hitter getting into a good launch position or getting into balance, but if you have a hand path issue I think it’s really hard for a guy to make a jump at the next level. IP: How do you “lay the foundation” with your hitters? BG: With as early as recruiting is these days, there are so many conversations that you have prior to your guys getting to campus. You talk some about adjustments they need to make in high school, and you talk a lot about the adjustments that you’re potentially going to make with them when they get to the college level. So by the time they get to campus, there’s really not going to be anything new. We think it’s really important once they get to campus to let them go out there and let them compete. You brought them in for a reason. If you bring a kid in and automatically make changes and he doesn’t have success, you really open yourself up as a hitting coach to losing the biggest thing you have to have with a hitter, and that’s trust. If you make immediate changes to them without letting them compete, now they’re looking at you as the reason why it’s not going how they want it to. In the fall, I try to let our hitters compete, talk to them about approach, and give them at-bats. When that’s over, they can come to you if they didn’t have success because of that trust you develop. Then you can begin to really go to work with them. IP: What are the main reasons that your teams haven’t seen the letdown that most others have with the bats changing?